Easter. These weeks are marked below with SB (Short Break accepted). 12pm or depart by 4pm. Booking from Friday to Friday. Accommodates up to 2 people and 2 pets. Any additional guests must be agreed with the cottage owner beforehand and are charged �50 per person per week or part week. The fire is laid for your arrival with a complimentary basket of logs. Additional logs may be purchased with the owners. 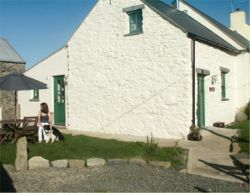 One well behaved dog is allowed in this cottage for a charge of �20 per week or part week.